There are four methods of the outputting of ads. This method is described in detail in the section “Settings”. 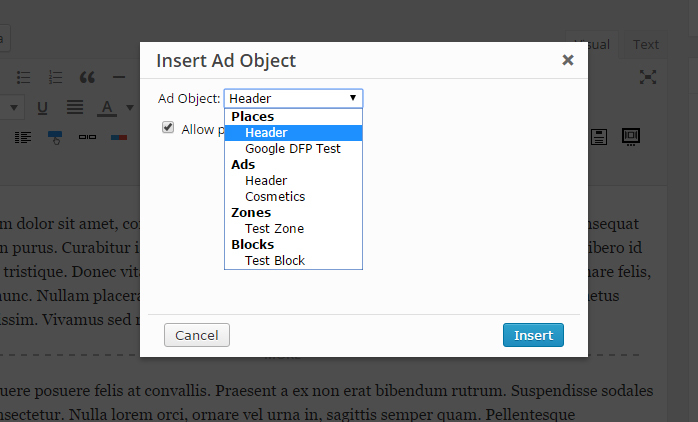 To display ads in any sidebar you can use the widgets of the SAM Pro Free plugin. There are four widgets – Ad, Place, Zone and Block. Just drop any of these widgets to the sidebar you need and adjust it. Title – title of widget if needed. Ad, Place, Zone, Block – select the necessary ad object. You can hide widget style (usually for the header widgets) and allow using predefined tags (Place, Zone). Click “Insert Advertisement” toolbar button, in opened dialog select necessary Ad Object and click “Insert” button. If necessary, check the box “Allow predefined tags”. The second digit is id of the Ad Object. Also you can use shortcodes in the WPtouch Pro Multi-Ads addon. In order that would insert an Ad Object in any place of theme template, use the samProDrawAd, samProDrawPlace, samProDrawZone or samProDrawBlock functions. 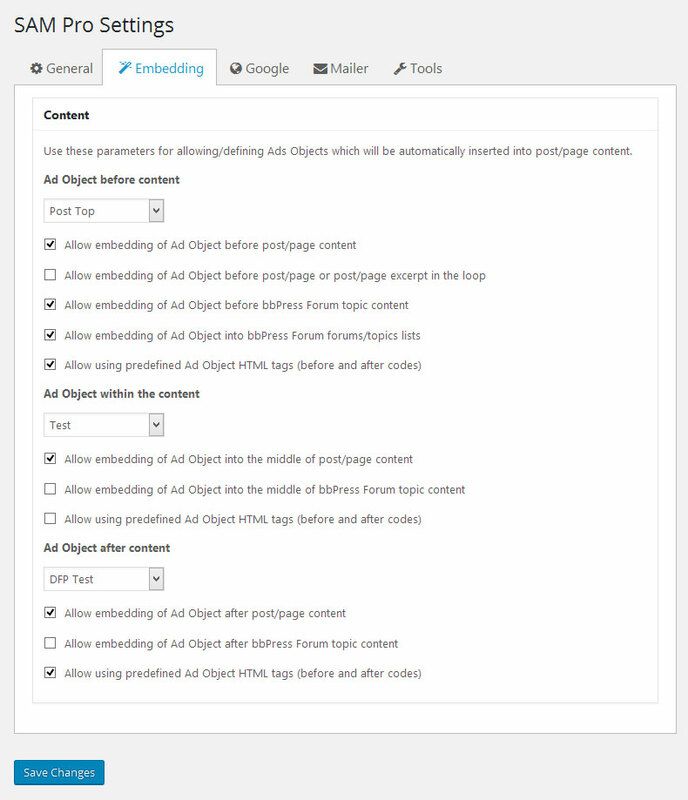 From version 2.0.0.75 you can use more flexible alternative of outputting ads. Using this method you can obtain an Ad Object and use its data as you need. For example for defining objects of Google Analitics. For that you should use public methods getAd , getPlace , getZone and getBlock of $samProObject , it is the global instance of the main plugin’s object. 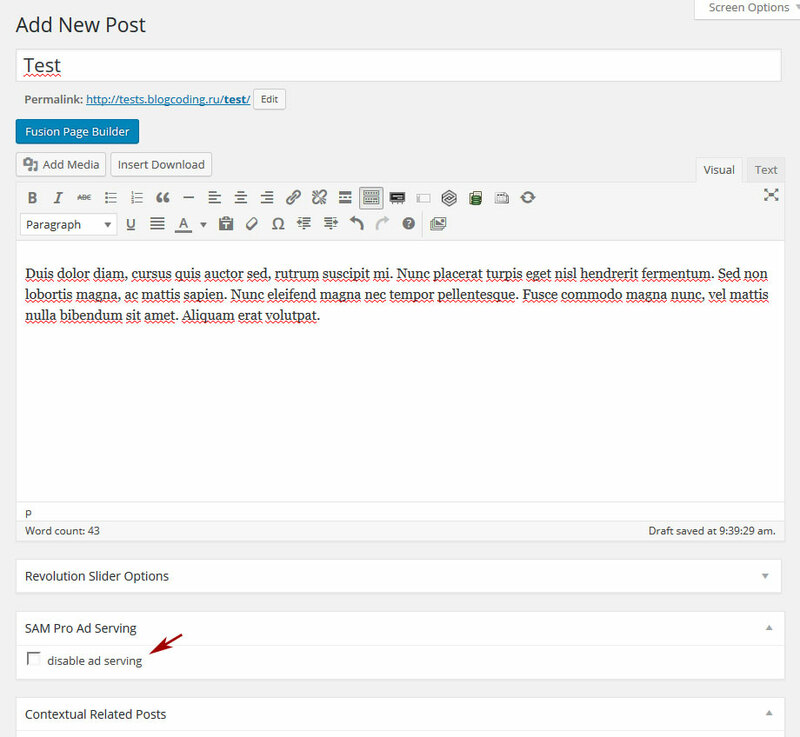 You can disable ad serving on any post or page of your blog. Just turn on “disable ad serving” checkbox. Ads will not be shown in this article or on this page. © 2015 – 2017, minimus. All rights reserved. I am using SAM PRO wordpress pluging in my dev environment website . but ads rotation/ scheduling is not working. means ads are not expiring after their time out. please gives us the right solution , what i am mission in scheduling ? You’ve enabled the rule of schedule on the Settings page? Hi, having the same issue, everything is set up correctly, and using samProDrawPlace( 5, null, true ); to output. With this, I still see the ads that are in the trash, and the ones that are out of scheduling. That is not supposed to happen. All the settings are correctly checked. But it seem to work with the widgets…. Wait for the next version … I think I found a bug. Hi, I am using SAM Pro Free, I have 3 places on a post top, widget and bottom. I want to have 3 adverts that are from 1 campaign on the page at the same time. Example: 3 ads regarding apples at the same time on the same page, then i refresh and there will be 3 ads regarding oranges at the same time on the same page. Is this possible? I cant find any option for this. I tried weight but i don’t think this is correct. And there is no documentation on this option that i can find. Please help. This is not possible. Different Places do not depend on each other. yes, sure i’ve done it, yet this is not able to expire the ads. When attempting to get a shortcode, I always get a -1 as the response, with no shortcode. Thoughts? I am using SAM (old version) without activating the stats. Hostgator has blocked my 4 sites (.com) on a shared hosting plan due to cpu overloading. I should delete the plugin to avoid blocking of my sites and use WP Super Cache instead of running the more cpu consuming W3total cache. Would the change to SAM pro free with wp super cache solve these kind of problem and which settings shall I activate? I have about 1 million visitors a month on my sites. Thank you very much for your recommendations. 1. The new plugin requires significantly fewer resources for the collection and storage of statistical data. Thanks a lot for the very fast answer, SAM! If I switch to SAM Pro Free do I have to deactivate the SAM Plugin before installing the new one or should I install the new SAM first without deactivating the old one go to tools of the new one starting the migration process according to http://uncle-sam.info/sam-pro-free/sam-pro-free-docs/tools-2/ and deactivate and delete the old one then. I don’t like to loose my ads and all the settings in the changing process. I haven’t found a step by step instruction to make sure that I don’t loose my ads. I would appreciate your instructions. Are we able to still use ‘Customizable limitation of displaying advertisements on single post page or author archive page by author’ as we were with Simple Ads Manager. Yes, but you should turn on the necessary rules on Settings page at first. I’m using Sam Pro(Free Version) for showing ads and I used the shortcode method. Assume I have place with id 24 which contains three ads. Now I want to display those three ads by the place id in front end. I wrote the code echo do_shortcode(““) in my template file but it is displaying only one ad at a time. Can you please tell me what is the way to display multiple ads contained within a place ? If you want to show 3 ads as a grid of ads you should use the Block object. If you want to rotate ads by time intervals you should use SAM Pro (Lite Edition) plugin. Hi fantastic plugin – only thing that does not work for me is the geotargeting thing. I have chosen dp ip as provider entered the api key and followed all the rules in the docs. The region database is populated and i can select country & state. I just doesnot work eg if i exclude my home country – ads still show up. Made several trials with international checks. Tried on a different install – same effect. Anything that needs to be done server-side or any other idea. Site test url is kalender-2016.de/kalender-2016-bayern-t/. Thanks for a quick response. The one part of concept is: if you show single ad, you want to show it without restrictions. You should show ad as part of Place if you want to use restrictions. Create new Place and link your ad to this Place. All rules defined for ad will work. thanks for your very quick response. I followed your instruction and now it works if the ad is linked to a place and it is embedded on the site. I’m terribly sorry! It’s my mistake. I forgot remove the debug functions from the file mixmind-client-2.php. Open this file ( sam-pro-lite/tools/mixmind-client-2.php) and remove lines 61, 62, 63. Thanks for your quick support – no error messages anymore. it´s strange however that country exclusion works with DP-IP but not with Mindmax (with exactly same settings – just changed the geotagging source, tested with geopeeker). Hi! I’m using SAM Pro Free to display ads on a site but due to some special requests of the website owner I need to print ads using functions and wrapping tags. I’ve copied your example (btw, in the exaple there isn’t third parameter, I’ve passed true) but the plugin doesn’t print before and after that I’ve chosen, so I’ve checked your files and… it seems that the constructor of the ad take the args but don’t use them! There is no “if ($before) print…”! Is it a pro feature and is it written here in the free documentation by mistake? Or simply did you forget to use them? The wrapping tags are using only by the Place and are handling by the Place. The tags parameter exists only for the future use and for compatibility with Full version of the plugin. My problem remains… I need to wrap the ad in some div class=… but the function echo the ad instead of returning it, so if I print the div either in my function.php or in the widget, the result will be the ad printed before my divs. Can you make a function that return the ad insted of printing it? Thank you so much for you interesting! but is an hack, so it’s impossible for me to update the plugin without hacking it every time. I would love if this worked! Using the latest wp version I disable the ads and they still display (even when added to trash), the active/inactive does not stop the ad from displaying, the page placement – location (what pages to display on , etc.) don’t work either. The widget worked but those pages showed the same add twice since the ad shows everywhere unless I check the page to disable the ad server or unless I disable the plugin. So the ads show up unless 1. I disable the plugin or 2. I disable the ad server, I tried everything else except disabling the other plugins. Wondering if another plugin is causing conflict ( i have a widget placement plugin “Display Widgets”). Any suggestions would be appreciated. If you use caching, you should flush cache. I can’t find much information about how the “weight” field works. What is the range of numbers I can put in the field? If I enter an ad’s weight as “3”, does that mean it gets shown 3 times as often as an ad with weight of “1”? What are the numbers I have to enter in that field to make sure an ad appears more often than others? Yes, you are right. The value of the ad weight can be from 0 to 10 (0 – not displaying , 10 – maximum shows of an ad). Use “10” value to show some ad more than another ads. Set weight for other ads lower than “10”. Thank you for your reply! If I may make a suggestion, I think it would be a better user experience if the weight input would not allow a number higher than 10. For example, my colleague was entering numbers like 75 or 99 and getting confused that it appeared his ads weren’t weighting the way he thought they would. We are calling Ad through function call in the frontend. How do check Schedule start and end time. Based on this, i need to display. Please i had a problem with SAM, i have an ad that show an especific category, but doesn’t work, just i wanna know if can i send the category to show and display that ad just for that category. I’m hoping you can help me. We recently switched our WordPress database’s table prefix (for security reasons). We changed every table name and ran a search-and-replace on all instances within the database. Now I’ve got the site back up. I’m able to see all of my ads in the backend of WordPress, but for some reason they’re not appearing on the frontend. Could this be a result of the table prefix renaming? And if so do you know how I could resolve this issue? Never mind, I solved the issue. Turns out there were a couple foreign key constraints that I forgot to change over. I cleared all settings and data from the plugin, reloaded the SQL database information and now I’m back up and running. I´ve written a function that inserts the ad place after more-break in wordpress. I´ve the problem, that the ad place is drawn before the more break. But it doesn´t work. Isn´t it possible to save the return of this function in a variable? I think you can write the code you need using this example. Hi, thank you for this great plugin. I am using the samProDrawPlace function but wondered is there a function I can use to query the title and description of the ad that is returned? I want to pass the ad name to Google Analytics Tag Manager as an extra data layer. You can’t obtain ad name using samProDrawPlace function. To my mind this is useful feature and I’ll add it into the next version of plugin. To display the ads, we are using the SAM Pro Place widget items. I setup Sam Pro Ads on my site but no matter what I do, I can not get the stats to email out. I get an error An error has occured. Mail not sent. I click the advertiser it highlights then I click the mail icon and it will not send. Is it possible to set up an ad Block that displays three identically sized ads, all linked to the same group of ads, but prevents duplicating the same ad on multiple places? Does that make sense? I tried doing this by creating a Block of 3 ads, and then choosing the same Place for each of the three. The result was all three ads showing the same thing. Please let me know. Thanks! The drop down menu does not show any Ads object. Is there any one to fix that? I can’t seem to find on this site where you describe the differences between ads, places, blocks, and zones. (I know it’s here; I just can’t find it!) I want to rotate a block of two ads (120×600 skyscraper and 160×600 skyscraper) with a single ad (300×600 skyscraper), but I can’t figure out how I need to set that up to be able to display both options. Copyright © 2015 - 2016, minimus. All rights reserved.